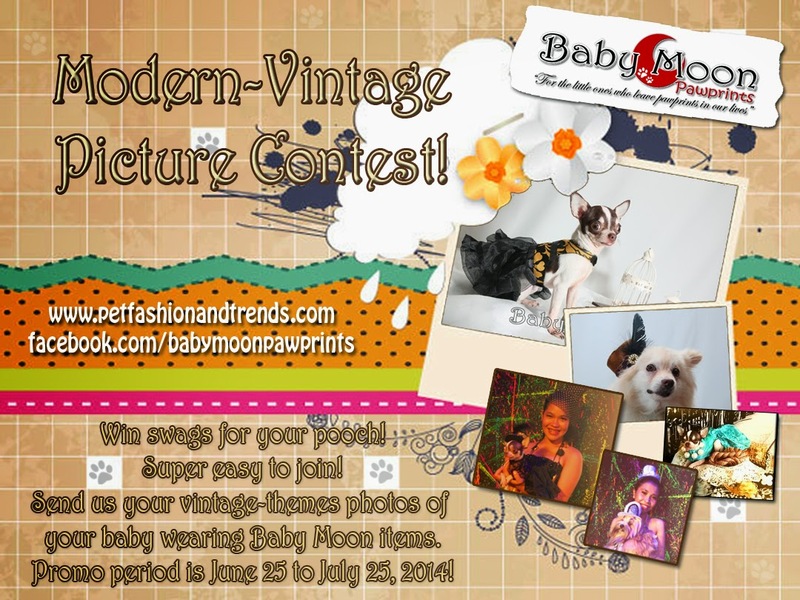 Pet Fashion and Trends Philippines: Modern-Vintage Picture Contest! Open to all pet owners residing or has a Philippine mailing address. Prizes will be sent via express mail. Got a photo of your pet in Baby Moon hat, accessory or outfit? Send us their best photo and win one of these goodies! Photos must not be bigger than 10mb. Must be submitted in jpg format. If we can’t open the picture, we can’t post it! The theme of the photo is “Vintage” or “Modern-Vintage.” It is up to you how you interpret this. (Vintage themes can be from Victorian Era all the way to the 1960’s. Sample Vintage era themes could be art deco, Jane Austen, gothic, utilitarian wartime, flower power, etc.) The best interpretation will be chosen. Grainy or photos not in theme will not be posted. You may take photos indoors, outdoors, in a set or on the moon! Photo shop is permitted but Baby Moon has the right to decide if photos are too altered. Pets and Baby Moon products should be clearly seen. Props and borders can be used if it enhances the theme. Animal cruelty is not permitted. Send all entries via PM to Baby Moon Pawprints facebook or email babymoon.lifestyle@gmail.com. Subject should be Modern-Vintage Photo Contest. Any other subject might get lost in the spam box. Send your name, pet’s name, age and breed. Send your contact details (e-mail, cell and landline). Put your title too. Optional: Send a 2 to 6 sentence caption on what your photos are about. Too big photos that cannot load. Max is 10mbs. Photos in a format we cannot open. Too many photos in one e-mail. We can accept up to 3 entries per person. Number of dogs can be up to you. All pets must be in Baby Moon. Do not send different versions. Once entries are sent, it will be judged. Great photos will be posted and can be ready to share for likes. Baby Moon Special Pick! "Pick of the Bunch!" Prizes will be sent to you via Xend or LBC. Winners will be contacted by e-mail and have one week to reply. Reply with complete mailing address to receive prize. Photos submitted will be used by Baby Moon for promotional materials. Photos submitted must be owned by sender. If the photo is not yours, it must have permission of owner. If pet is not yours, it must have permission of owner. Processing of winner and prizes will need 10 days after winner replies. Contest winners will be posted and if there is no contesting the results or doubts, the prizes will be sent. Baby Moon has the right to disqualify questionable materials. By submitting entries, you have read the fine print and mechanics of the contest.